Last night was not a great one for me. I had a really stressful day at work and was not in my best form when I got home (feeling out of sorts and a tad blue). I kissed my family hello then began my evening routine….Dinner was made & kids were fed, homework checked, laundry started, dog walked, kitchen cleaned up and then finally I settled on the couch for a little mindless television. Alas, there was nothing on tv worth watching, not even on the cooking/food channels. 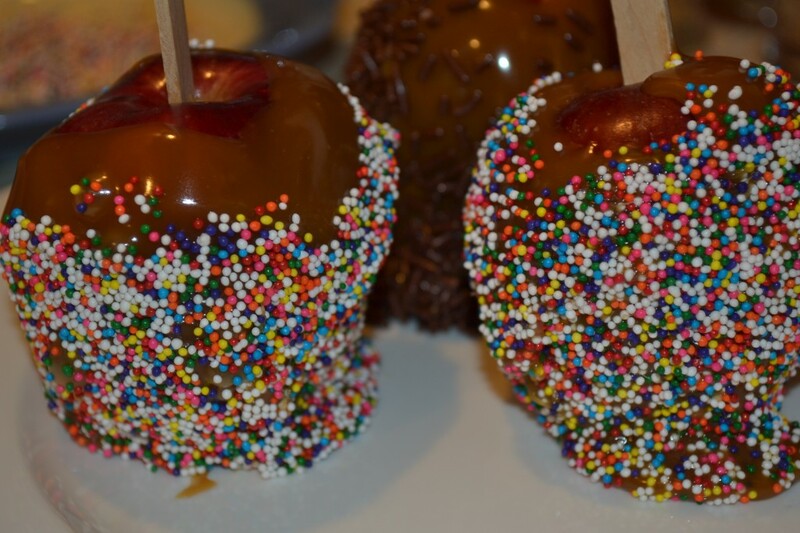 I suddenly had a great idea…make some caramel apples! 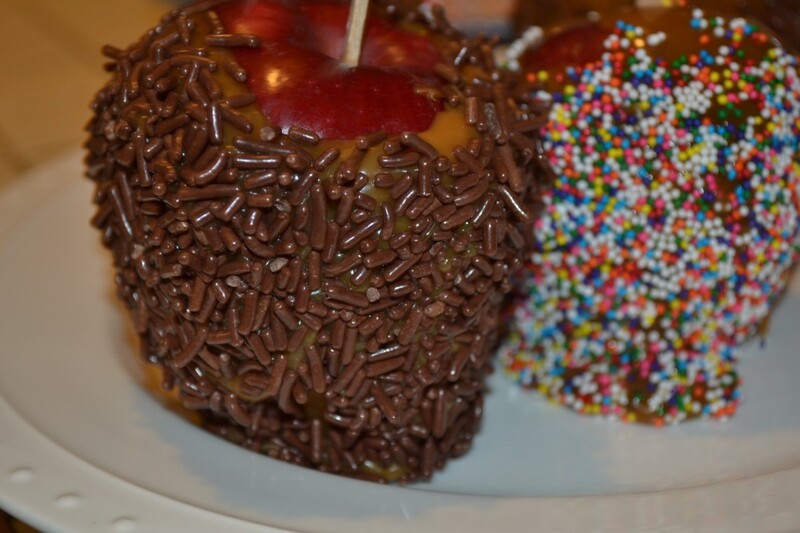 I had all the ingredients (apples, microwave caramel, sprinkles) and maybe a little sweet was just what I needed. 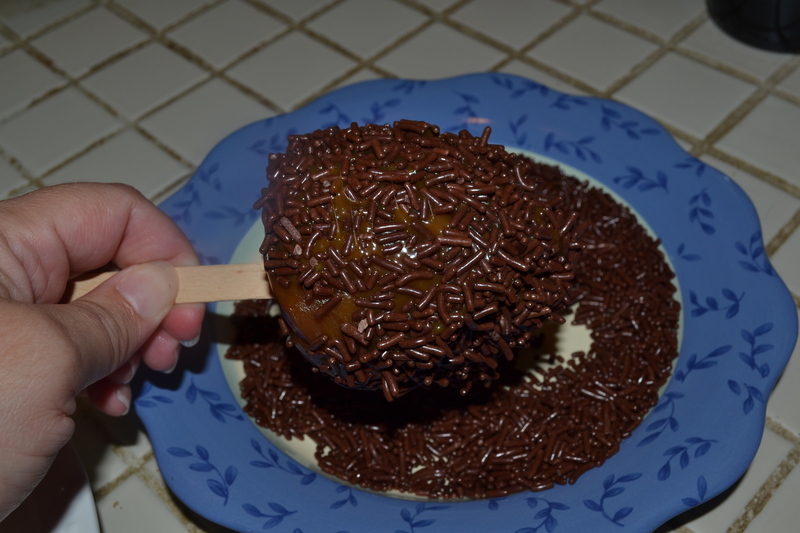 Apples are good for you so it’s not really a desert, right? 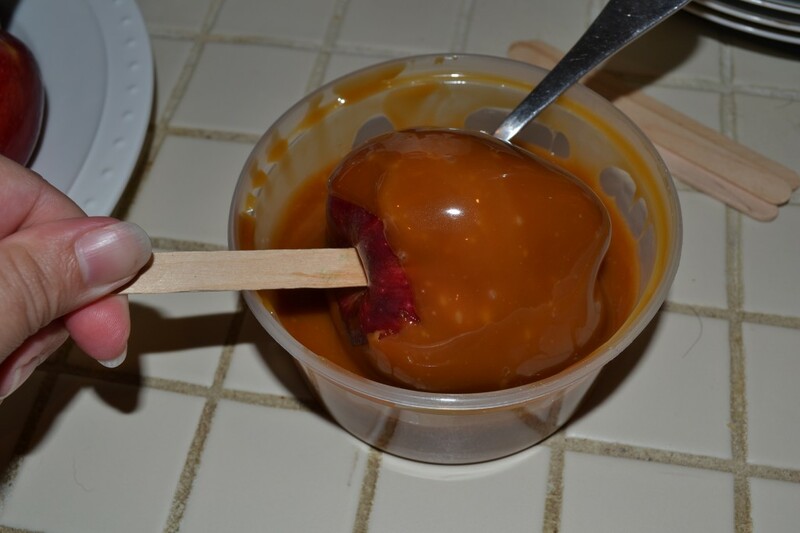 Somehow I talked myself into making these wonderful, sticky, chewy & sweet caramel apples. 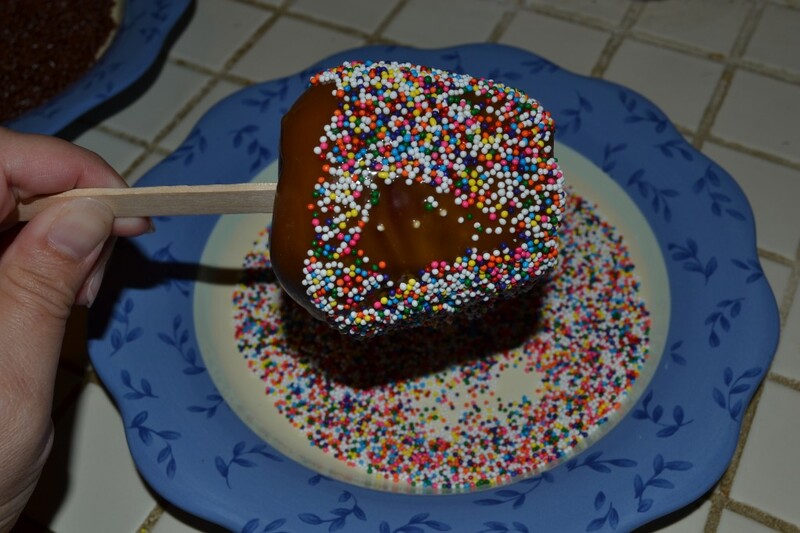 The topper was rolling them in nonpareils and sprinkles, as if the caramel coating wasn’t enough sweetness for me. 🙁 I ate two of them 🙁 . In my defense, the apples were very small and I am sure that two of them equalled only one regular size apple, at least this is what I keep telling myself. 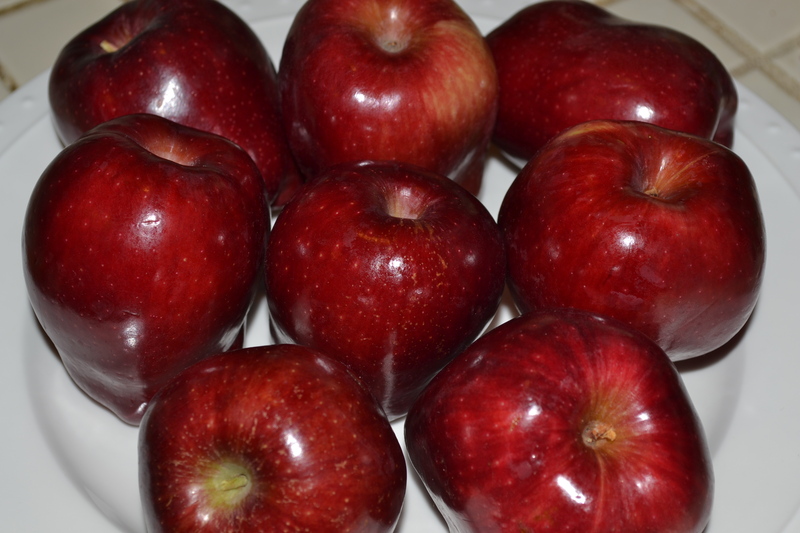 I have the remaining apples ready for the boys when they get home from school. My youngest spotted the plate full of chewy goodness and wanted to take one in his lunch today. I had to say no. Somehow I just don’t think his teacher would appreciate the sticky mess that comes with eating these little gems, not to mention the sugar rush that would hit him after lunch…during the middle of math or reading or whatever. So, today I start anew & shake off the malaise of yesterday. Here’s to beautiful autumn days, sunshine and the shower of early falling leaves. 2 lbs. ground beef, use your own preference for chuck/sirloin/blend of these, etc. First things first, get your charcoal grill going so it will be ready when the patties are finished. Then, in a large bowl I put 1 lb. of ground chuck and 1 lb. of ground sirloin. I blend these together and then add my salt, pepper and garlic powder. (Add your seasonings according to your preferences). Once blended I set the bowl aside and wash my hands. Next I prepare all the condiments. 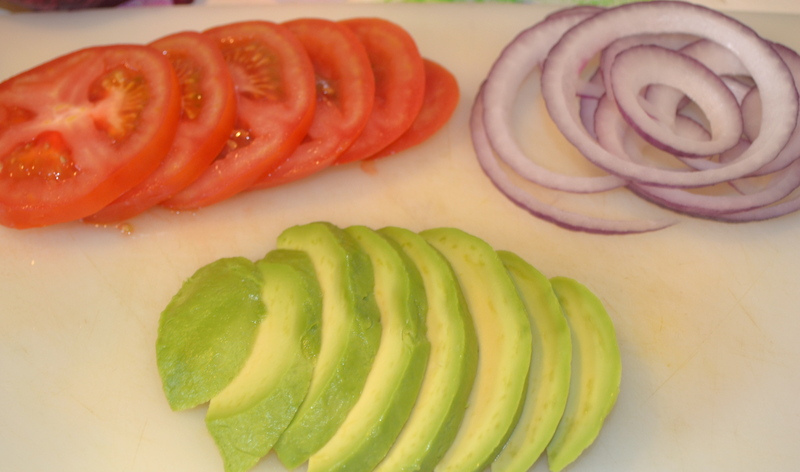 Slice the cheese into rectangles, slice red onion into rings, slice up the tomato and avocado. Set condiments aside. 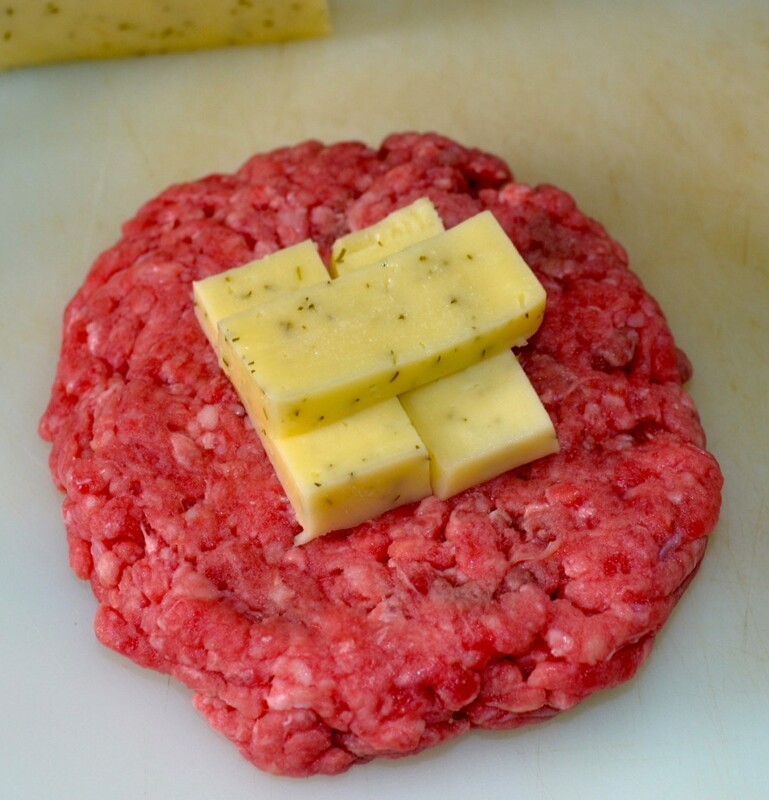 Back to the burgers: Flatten a portion of ground beef and place some cheese in the center. Next mold the ground beef around the cheese, enclosing it inside the patty and carefully flatten it out again. Depending on how much cheese you put in the center, you may need to grab a little extra ground beef to cover the cheese well. Repeat for remaining patties. Once the grill is ready I put on the burgers. I don’t move my burgers around a whole lot once I put them down. I let them cook and when they release easily from the grate I flip them over. The cheese does sometimes find a way to ooze out of the burgers (see the finished product in the top most photo) and there isn’t much that can be done about it once it happens but if you are careful and seal up the cheese inside the ground beef you should be all set. I don’t let it get to me when the cheese breaks free, my kids still thinks I am queen of the charcoal grill! We are a family of 5 and this recipe makes enough for everyone and an extra or two, depending on how big I make the burgers. 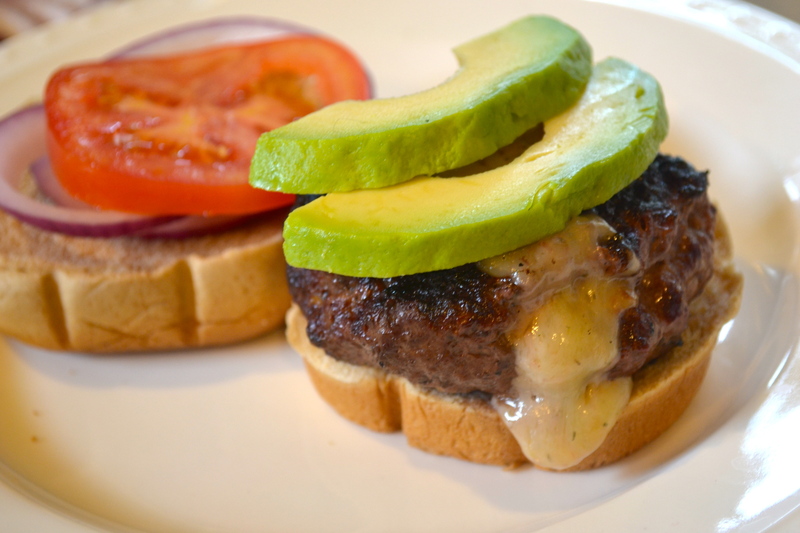 Morgan isn’t always a big eater so I make a small burger with no cheese inside and just melt some on the top for him. My boys loves the onion/tomato/avocado toppers. I especially love the smooth & creamy avocado with the snap of the red onion. Add a garden salad to each plate and you have a wonderful family meal with no pots and pans to clean up. Next: Dessert a la Evan! 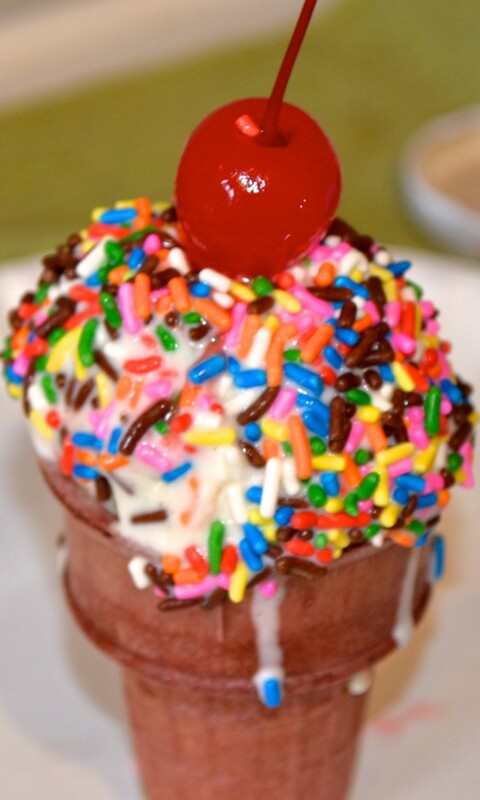 For dessert my son Evan made us all vanilla ice cream cones dipped in sprinkles and topped with a maraschino cherry. We sat outside eating our cones and listening to the frogs “talking” to one another down at the lake. It was a lovely evening. Now the boys are all in bed, dog & kitty curled up in their respective spots and I am going to settle down for some Agatha Christie mysteries on Netflix.